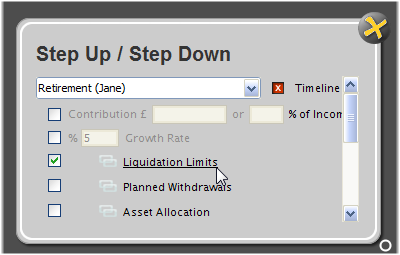 Liquidation Limits and Planned Withdrawals - Tools for controlling future asset liquidations – Have a question? Automatic withdrawals from savings and investments – those taken by the software only when needed to prevent shortfalls – can be controlled, if necessary, using Liquidation Limits and draw down strategies. You can limit or prevent ad hoc withdrawals from being made by the software or schedule future withdrawals to be made from one or more accounts at any given point in the timeline using the software's Liquidation Limits / Planned Withdrawals panels. 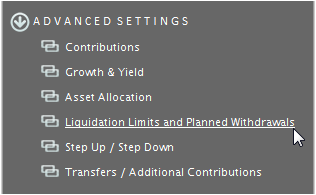 These panels are found under Advanced Settings on the Investments and Savings screens. For example, your clients have a special savings account for their children’s university expenses. No funds are to be drawn from this account until their children start university. To prevent any possible ad hoc withdrawals from being taken from this account prior to these university years, you could set a liquidation limit on the account, preventing any withdrawals from being made from the account until the children start university. Liquidation Limits and drawdown strategies are strictly optional and in most client cases you will probably have no need to use these settings; simply let Voyant work out the cash flow for you. However, these settings are available to give you a greater degree of control over asset liquidation should the need arise. 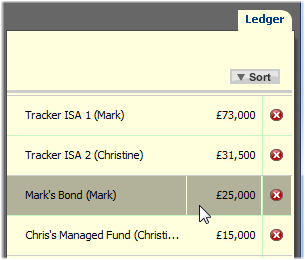 Note that the crystallisation of money purchases and income from drawdown pensions are scheduled differently, using settings on the Pensions > Money Purchase and Drawdown Pension screens. 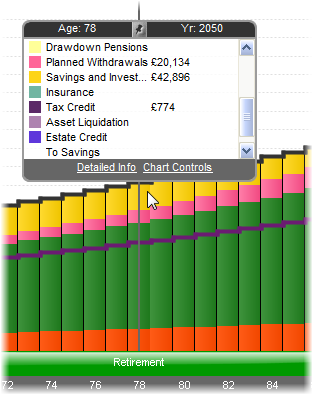 Planned withdrawals will appear in the Let's See > Cash Flow chart - with the Detailed view ticked in the chart panel at the bottom of the screen - in the pink "Planned Withdrawals" category. Ad hoc withdrawals made by the software (as well as transfers between accounts) will be shown on the chart in the gold Savings and Investments category. 1. First add an event to your timeline to schedule the year in which these withdrawals are to begin. This is only necessary if an appropriately timed event isn’t already present on the timeline. A single event could be used to schedule withdrawals from multiple accounts, provided they are to begin in that same year of the plan. In most cases withdrawals are scheduled to begin using events; however, stages also could be used. A draw down could be scheduled to begin at the start of a given stage - e.g. at the start of the Retirement stage. 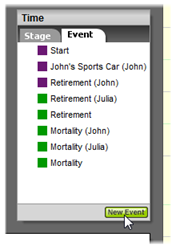 - Go to the Time panel to the right side of the Savings or Investment screen and select the Event tab. 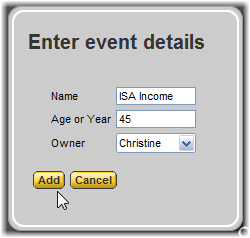 Click the New Event button in the bottom-right corner of the panel and enter the name, age, and owner of the event.Events can also be scheduled by year on this dialogue. 2. On the ledger to the right side of the screen, select the account from which the withdrawals are to be made. 3. 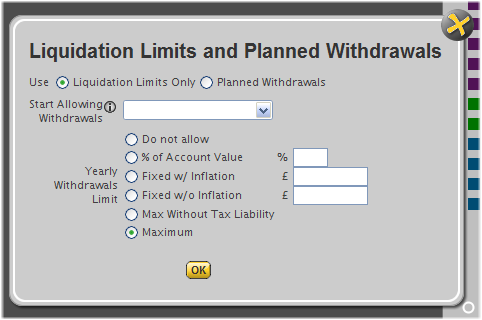 Expand Advanced Settings and select Liquidation Limits / Planned Withdrawals. 4. Select the Planned Withdrawals button. 5. Next to the Yearly Draw Down Amount, enter the amount that is to be withdrawn from the account. Drawdowns can be taken as a percentage of account value or a specified amount, with or without inflationary indexing. Bonds have the additional drawdown option of taking the maximum drawdown without (any) tax liability. 6. In the Start Draw Downs drop-down menu, select the event that will be used to schedule the start of these withdrawals. This would be the event you added a moment ago. 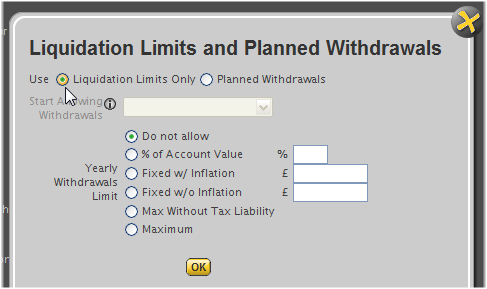 The bottom half of the panel shows the software’s withdrawals limit. Again, liquidation limits are strictly optional restrictions you can place on the software’s ability to take additional funds from the account, only when needed to help fulfil expenses. If you want to allow the software to potentially take any funds above and beyond the drawdown in order to fulfil future expenses (only when needed to top up income), select Maximum. Otherwise, you may limit withdrawals to the scheduled drawdown amount specified above by selecting the Limit to Draw Down option. In rare cases one might set another limit, higher than the drawdown, for ad hoc liquidations. Options are available to set this liquidation limit when needed. What happens to funds once they are withdrawn from an account? Following draw down, these funds will flow into general cash where they will first be made available to cover expenses and make scheduled contributions to other accounts. 1. First add an event to your timeline to specify the year in which these withdrawals limits are to begin. Adding a new event is only necessary if an appropriately timed event is not already present on the timeline. If for example, withdrawals are to be prevented from the very start of the plan, you will use the Start event. In most cases liquidation limits are set using events; however, stages also could be used. A liquidation limit could be scheduled to begin at the start of a given stage - e.g. at the start of the Retirement stage. 2. 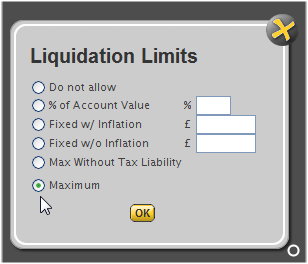 In the ledger on the right side of the screen, select the account on which liquidation limits are to be placed. 4. The Liquidation Limits button should already be selected by default. 5. Next to the Yearly Withdrawals Limit, set the liquidation limit either by disallowing withdrawals entirely (the "Do not allow" option) or specify a limit using the options provided. 6. 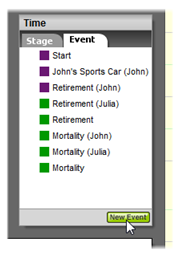 In the Start Allowing Draw Downs drop-down menu, select the event from the timeline added earlier. This list will be disabled if the “Do not allow” withdrawals option is selected. 1. Go to the Investments or Savings screen and on the ledger on the right side of the screen, select the account on which liquidation limits are to be removed. 2. 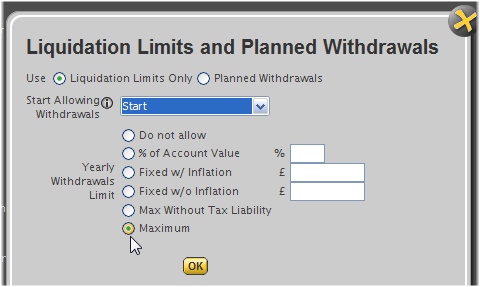 Expand Advanced Settings and select Liquidation Limits / Planned Withdrawals. 3. The Liquidation Limits button should already be selected by default. If you have a Planned Withdrawals selected, you may leave it in place. 4. Next to the Yearly Withdrawals Limit, set the liquidation limit to "Maximum", which means the software can take up to the maximum amount available from the account, only if needed, to help fulfil expenses. 5. In the Start Allowing Draw Downs drop-down menu, select the Start event. The settings you enter on the Liquidation Limits / Planned Withdrawals panel will schedule the initial withdrawals or limits on ad hoc liquidations. 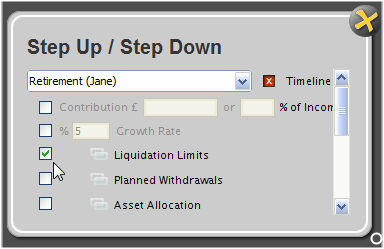 These scheduled withdrawals or liquidation limits can later be increased or decreased or ended altogether using the Advanced Settings > Step Up / Step Down panel, on the Investments and Savings screens.